The closest beach is 70 m away. The property is 50 m away from the coast. The town center is 500 m away. Grocery store - 500 m. Closest restaurant - 500 m. Closest infirmary/hospital - 20000 m. Closest public transport (bus etc) - 2000 m. Airport - 65 km. Train station - 50 km. Ship / ferry port - 50 km. Instant booking unit Apartment type: A1. The apartment has 4 bed/s for adults. There is/are 1 extra bed/s. Capacity (adults) is (4+1). It has 3 stars. Apartment has 56 m2. It is on the first floor. Access for the disabled is not enabled. Number of bedrooms: 2. Number of bathrooms: 1. Number of balconies: 2. TV set, SAT-TV, coffee table in the living room, couch/sofa, the apartment is soundproof, smoking not allowed inside the apartment , air conditioning in the hallway with surcharge. Table and chairs, kitchen sink, hob with four cookers, electric and gas hob, oven, refrigerator, freezer, microwave, toaster, water heater. The bathroom has 3,50 m2. Equipped with: bath tub, toilet, tiles, bath towels. Balcony/teracce of the apartment has 3 m2. 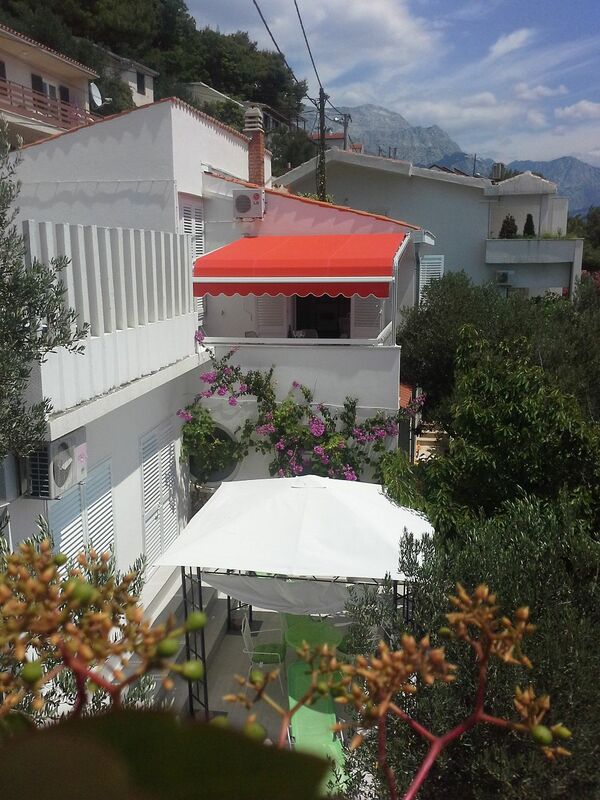 Features and equipment: covered, orientation sea side, sea view, garden view. Balcony/teracce of the apartment has 9 m2. Features and equipment: seating set, orientation sea side, sea view, garden view, mountain view. Instant booking unit Type of studio apartment: SA2. The studio apartment has 2 bed/s for adults. Capacity (adults) is (2). It has 3 star/s. Studio apartment has 23 m2. It is on the ground floor. Kitchen, living room and beds are in the same space. Access for the disabled is not enabled. Flooring: laminate, tiles. The studio apartment has double bed. Bedding, air conditioning with surcharge, TV set, SAT-TV, sitting area, smoking not allowed inside the studio apartment . Table and chairs, kitchen sink, hob with two cookers, electric hob, oven, refrigerator, freezer, water heater. Bathroom has 4 m2. Equipped with: shower cubicle, toilet, tiles, bath towels. Balcony of the studio apartment has 15 m2. Features and equipment: seating set, ground floor (garden terrace), orientation sea side, seaview, garden view.